. . . two Won. I suspect the hairstyle wouldn't suit me. It will be fun to see in a few weeks when everyone in NK is spouting that look. They should make the women do it too. Like father, like son. The Kims really are style icons. That NK haircut rumor debunked. "A viral report this week claimed the North Korean government forces male college students to get Kim Jong Un's haircut. The problem with the story: There's no evidence it's true. The story originated with Free Radio Asia, a not-for-profit news agency based in Washington, D.C. The story reported the ruling Workers' Party ordered students to get the leader's hairstyle with "shaved sides and long parted top," according to the Free Radio Asia story. Radio Asia reported there was no written directive and cited unnamed sources. 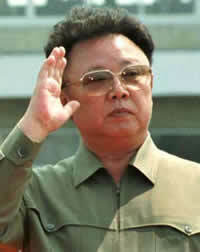 But the Associated Press reports, "North Korea watchers smell another imaginative but uncorroborated rumor." The AP spoke with Simon Cockerell of Koryo Tours, which specializes in bringing foreign tourists to North Korea. Cockerell told AP, "I was there just a few days ago, and no sign of that. It's definitely not true." Also, an AP journalist in Pyongyang said he had not seen any recent changes in hairstyles among college students in the capital. NK Newsalso spoke with recent visitors to North Korea, who said the same. "Everyone had typical haircuts last week," said Andray Abrahamian, executive director of Singapore-based NGO Choson Exchange, which works regularly with young North Korean professionals, reports NK News. It's not unheard of for the North Korean government to mandate how citizens can style their hair. In 2005, the government directed men to keep their hair short, no longer than two inches, the AP reports. "Older men received a small exemption to allow comb-overs," according to the AP. Add the Kim Jong Un hair mandate rumor to other unconfirmed and later debunked stories coming out of North Korea, including one in January that Kim Jong Un killed his uncle by feeding him alive to a pack of hungry dogs." I'm shocked, shocked I tell you, to find out that stories ont he internet might not be true. Rather than start another thread: it seems the Great Successor is unwilling to take his untamed locks out of the country.